BACKGROUND AND PURPOSE: To report our experience in the treatment of brain arteriovenous malformations (BAVMs) using Onyx (ev3, Irvine, Calif). Patients and METHODS: From January 1999 to October 2004, 94 patients with BAVMs were treated endovascularly in our department. They were 51 (54%) men and 43 (46%) women with a mean age of 32 years. A total of 210 endovascular procedures were performed with Onyx as the sole embolic agent in 88 procedures; Onyx and n-butyl cyanoacrylate (n-BCA) were used in combination in 50 procedures, and n-BCA alone was used in 72 procedures. RESULTS: The course of endovascular treatment was completed in 53 patients. In 26 patients (49%, 26/53) an angiographic cure was achieved using embolization as the sole therapeutic technique. Seven (13%, 7/53) patients underwent a surgical resection of the residual BAVM nidus, 20 (38%, 20/53) patients underwent radiosurgical treatment after nidal size reduction <2 cm was accomplished by endovascular treatment. Further endovascular treatment was planned in 33 patients, whereas in 5 patients, the continuation of embolization was aborted due to difficult nidus catheterization. Procedure-related permanent neurologic deficits were observed in 8 (8.5%, 8/94) patients. There were 3 procedure-related deaths. CONCLUSION: Onyx is suitable for brain BAVM embolizations and allows obtaining higher rates of anatomic cures compared with those obtained previously with other embolic agents. 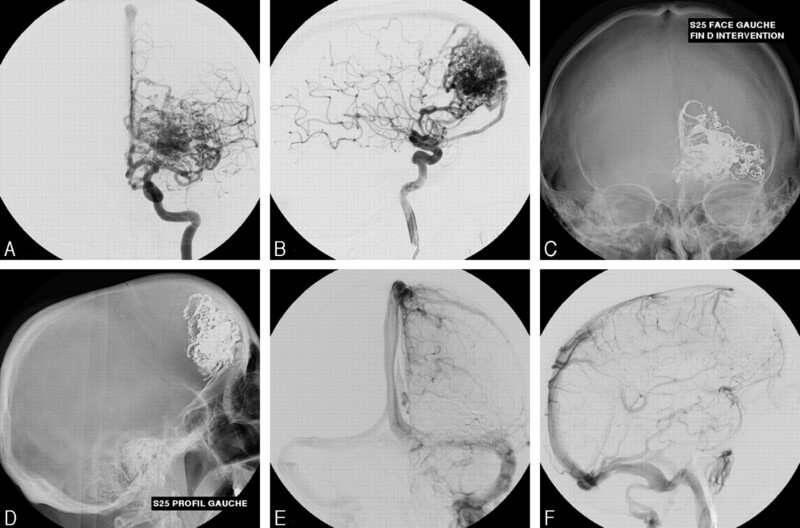 The management of brain arteriovenous malformations (BAVMs) is a multidisciplinary task that includes embolization, neurosurgery, and radiosurgery. Embolization with particles of polyvinyl alcohol (PVA), either alone or in combination with alcohol or coils, was used to ease the surgical removal of these lesions.1,2 Alternatively, endovascular treatment (EVT) using liquid adhesives, such as n-butyl cyanoacrylate (n-BCA), was used in numerous centers, aiming for either a preoperative reduction of the BAVM size or an anatomic cure, which is achievable in only a limited number of patients. Until now, n-BCA has been used in conjunction with radiopaque substances such as tantalum or ethiodized oil (Ethiodol) to render the embolic mixture visible with x-rays. In addition ethiodized oil slows the polymerization of the glue mixture, which is triggered by contact with ionic solutions such as blood or saline.3,4 Although these modifications and the increasing experience in handling have improved its control, the use of n-BCA remains unpredictable to some extent, even in experienced hands. This adds to the already existing procedural risk of neurologic deficit caused by either inadvertent occlusion of a normal cerebral artery or occlusion of the draining vein(s), resulting in an intracranial hemorrhage. Onyx (ev3, Irvine, Calif) is a biocompatible polymer containing ethyl vinyl alcohol dissolved in an organic solvent, dimethyl-sulfoxide (DMSO). It has recently been introduced as a liquid embolic agent for BAVM embolization. It is characterized by a different process of solidification that consists of copolymer precipitation instead of polymerization (ie, as in n-BCA). This allows a slower and more controllable injection and, in theory, should result in a more effective filling of the BAVM nidus. The purpose of our study was to report our experience in using Onyx and the clinical and anatomic results accomplished in endovascular treatment of brain BAVMs. From January 1999 to October 2004, 94 patients harboring a BAVM underwent at least 1 embolization procedure using Onyx. They were 51 men and 43 women ranging in age from 7 to 59 years old (mean, 32 years). In 37 (39%, 37/94) patients the symptoms were caused by intracranial hemorrhage, either a subarachnoid hemorrhage due to rupture of an BAVM-associated aneurysm in 4 (11%, 4/94) patients or an intraparenchymal hematoma and/or intraventricular hemorrhage due to the BAVM itself or the rupture of a draining vein in 33 (35%, 33/94) patients. Seizures were the revealing symptoms in 31 (33%, 31/94) patients and a transient neurologic deficit was the symptom leading to the diagnosis of the BAVM in 16 (17%, 16/94) patients. In 10 (11%, 10/94) patients, the lesion was asymptomatic and was discovered incidentally. The 94 BAVMs were classified according to the Martin-Spetzler classification (Table 1). Cortical BAVMs were supratentorial in 38 (40%, 38/94) patients and infratentorial in 35 (37%, 35/94) patients. Among the 10 deep-seated BAVMs, 6 (6%, 6/94) were located in the left and 4 (4%, 4/94) in the right basal ganglia. Four (4%, 4/96) BAVMs were located in the left cerebellum, 3 (3%, 3/94) in the cerebellar vermis, 2 (2%, 2/94) in the corpus callosum, and 2 (2%, 2/94) in the quadrigeminal plate (Table 2). The maximum BAVM diameter was <2 cm in 12 (13%, 13/94) patients, from 2 to 4 cm in 45 (48%, 48/94) patients, and >4 cm in 37 (39%, 39/94) patients (Table 3). In our department, EVT is usually considered the first treatment option. On the other hand, if there is concern that the nidus cannot be completely occluded and the BAVM is located in a noneloquent brain area with cortical venous drainage, a surgical removal is usually performed. If, after the patient has completed one or more embolization sessions, the remaining largest diameter of the nidus is <2 cm and the BAVM is located in an eloquent area, or when a deep venous drainage is evident, radiosurgery is then planned. In the case of an associated intraparenchymal hematoma that does not require immediate surgical removal, angiography is performed to detect an underlying intranidal aneurysm that should be excluded by embolization as soon as possible. Elective treatment of the BAVM nidus is then scheduled after a 3-month period to allow the hematoma to be resorbed, avoiding the risk of missing a part of the nidus that can be pushed apart and masked by the hematoma at the time of the first embolization. In the case of purely intraventricular bleeding, the EVT is initiated within a few days after the onset of hemorrhage. A brain CT scan was obtained before and after each embolization. All procedures were performed under general anesthesia. An intravenous bolus of 3000 IU of heparin was given to each patient. Then, a 6F sheath was placed in one of the femoral arteries. 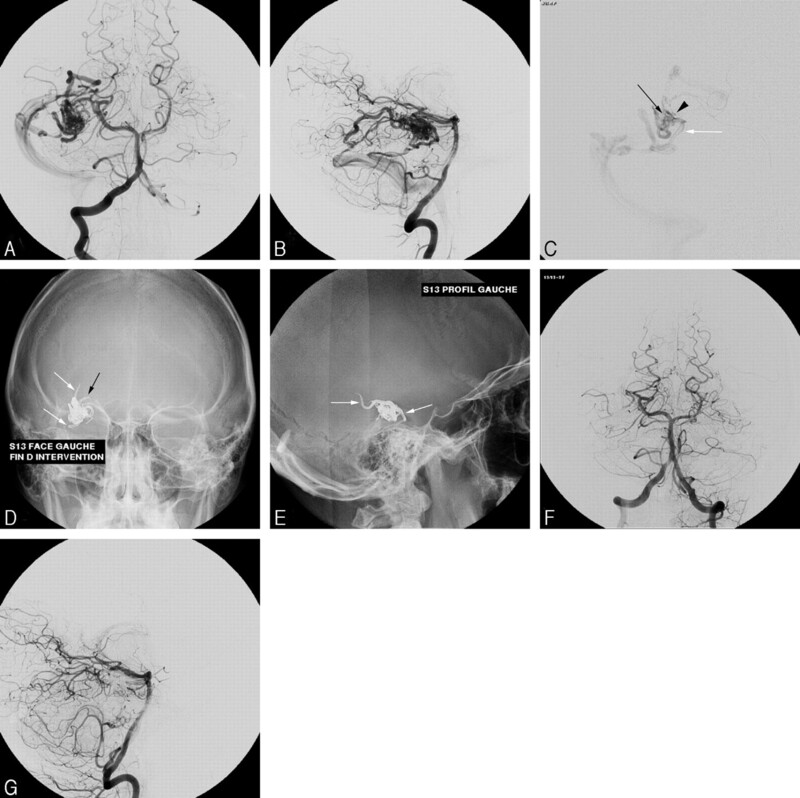 A 3-vessel cerebral angiography was performed, and a 6F guiding catheter was then inserted in either an internal carotid or a dominant vertebral artery that gave the best supply to the BAVM. If the lesion was supplied by 2 vascular territories (eg, a posterior temporal BAVM supplied by feeders from the posterior cerebral and middle cerebral arteries), a 5F diagnostic catheter was inserted within the collateral territory to be able to control the whole arterial supply during the embolizaton. We used DMSO-compatible microcatheters. Until July 2002, we used the Flow Rider (ev3); thereafter, we used UltraFlow microcatheters (ev3). Once microcatheterization as the close as possible to the nidus was achieved, a nonsubtracted single-shot image of the microcatheter with the guidewire inside was obtained when catheterizing the feeding pedicle to have a trace of the microcatheter trajectory and to be able to control precisely the Onyx reflux within the feeder. The guidewire was then pulled out, and a biplane supraselective arteriogram was performed via the microcatheter. The decision whether to use Onyx was made according to various criteria based on the results of the supraselective arteriogram. First, the tip of the microcatheter had to be as close as possible to the nidus, meaning that the feeding arterial pedicle was navigated distally up to the nidal network. Second, the feeding pedicle had to be occluded up to 1.5 cm retrogradely by the reflux of Onyx along the microcatheter. Finally, if a direct arteriovenous shunt was disclosed on the supraselective angiography before the embolic agent injection, Onyx was not used so as to avoid migration into the draining vein. If these criteria were met, the microcatheter was flushed with DMSO and the dead space of the microcatheter was slowly filled with Onyx over a period of approximately 40 seconds (a duration of 40 seconds was chosen to avoid a DMSO bolus in the cerebral circulation).5 Then Onyx was slowly and progressively injected into the nidus under continuous visual control using biplane subtracted fluoroscopy. Because of its low viscosity, Onyx had a propensity to migrate distally, penetrating deeply into the nidus. As soon as reflux along the microcatheter was observed, the injection was stopped for a few minutes and then resumed. Although in principle, a draining vein could be completely occluded only when the nidus was completely filled with the embolic agent (Fig 1). When passing through a vein, Onyx tended to initially laminate along the venous wall. The overall length of the injection depended on the amount of reflux, assessed by length of the embolic agent column in the feeding pedicle. The maximum reflux considered tolerable by our group is 1.5 cm. In this series, the duration of Onyx injections ranged from 3 to 72 minutes (mean, 24 minutes). Iterative biplanar angiographies were performed via the guiding catheter while injecting the polymer. The procedure was ended when the length of reflux was considered critical (>1.5 cm) or when angiography showed the total embolization of the nidus without venous stagnation. Right posterior temporal BAVM treated in single-session procedure. A and B, Initial angiogram showing the nidus and the cortical drainage veins in anteroposterior (AP) and lateral views. C, Selective angiogram in AP view showing the microcatheterization with an intranidal position of the microcatheter tip (arrowhead), the nidal network (arrow), and one of the draining veins (white arrow). D and E, Nonsubtracted images in AP and lateral view showing the Onyx cast with some degree of reflux into the arterial feeder (arrow) and the draining vein filled by the embolic agent (white arrows). F and G, Final angiogram in AP and lateral views demonstrating the total occlusion of the BAVM. When an intranidal positioning of the catheter was possible but the distal segment of the feeder could not be occluded because of reflux, or when a direct arteriovenous fistula was present, a modified acrylic glue (Glubran; GEM Srl, Viareggio, Italy) mixed with ethiodized oil (Lipiodol; Guerbet, Aulnay-sous-Bois, France) was used. In the former situation, we used a diluted mixture of n-BCA (20% Glubran/80% ethiodized oil); in the latter, a higher concentrated mixture was injected (80% Glubran/20% ethiodized oil). We first flushed the microcatheter with a 5% dextrose solution and then injected the n-BCA mixture under biplane subtracted fluoroscopy. To avoid trapping the microcatheter, the injection was stopped and the microcatheter was pulled back before 7 minutes in all cases. After the procedure, the patient's blood pressure was strictly monitored for 48 hours in the intensive care unit to avoid any blood pressure rise. Steroids were given intravenously (4 mg of methylprednisolone every 4 hours) for 72 hours after the procedure. In the rare event of a microcatheter stuck in the arterial feeder, aspirin was given orally for 3 months at a dose of 250 mg/day. When the BAVM was considered totally occluded at the control angiography at the end of the procedure, a follow-up angiogram was performed at 3 to 6 months. Patients for whom the embolization was followed by surgical removal of a residual nidus underwent a postoperative angiogram during their hospital stay within 10 days after surgery. Because a follow-up period of at least 2 years is required after radiosurgery to assess the efficacy of the treatment, angiographic follow-up for these patients in our group was not yet complete at the time this article was written but will be the subject of a future article in the journal. Clinical follow-up was based on the modified Rankin scale (mRS). A clinical examination was performed before the patient's admission and at the end of each hospital stay. There were a total of 210 endovascular procedures among the 94 patients (mean, 2.2 procedures per patient); each patient had received at least one injection of Onyx. Onyx was used in 138 procedures, either alone (n = 88) or in combination with n-BCA (n = 50). Acrylic glue alone was injected during 72 procedures. Because the angiographic assessment of occlusion rates was found to be rather inaccurate, we assessed the anatomic results by distinguishing between completely occluded or not. In the latter situation, we distinguished whether the reduction of the nidus to ≤2 cm (a dimension that corresponded to the possibility of complementary radiation treatment) was achieved. Among the 94 patients, there were 53 (56%, 53/94) patients in whom the treatment was completed; 26 (49%, 26/53) BAVMs were excluded by endovascular procedures alone, 7 (13%, 7/53) residual BAVMs were surgically removed, and 20 (38%, 20/53) were sent to radiosurgery after a sufficient reduction of the BAVM size (< 2 cm) had been achieved. For 33 (35%, 33/94) patients, the treatment was not completed. Because of the difficult nidal catheterization in 5 (5%, 5/94) patients, the embolization was targeted to an assumed epileptogenic area or a hemorrhagic BAVM portion and then stopped. After a total of 210 procedures in 94 patients, the neurologic status was unchanged or had improved in 80 (85%, 80/94) patients. We observed treatment-related neurologic deficit in 11 (12%, 11/94) patients (Table 4). The deficits were temporary in 3 patients (3%, 3/94). In all 3 cases, the deficits were related to BAVM bleeding that occurred after the procedure and were managed conservatively. The deficits were permanent in 8 patients (9%, 8/94). Three (3%, 3/94) patients died in relation to the treatment. Uncontrollable bleeding during surgical resection of a temporal BAVM remnant caused one death, another resulted from an arterial perforation during BAVM catheterization, and the last was caused by a hemorrhage as a result of premature occlusion of the draining vein with n-BCA. Of 88 procedures using Onyx only, 2 permanent neurologic deficits were related to the procedure (2.5%, 2/94). One was a hemorrhagic and the other an ischemic complication occurring within 48 hours after the procedure. Of 72 procedures performed using n-BCA alone, there were 5 permanent neurologic deficits (7%, 5/72), 3 hemorrhagic and 2 ischemic complications. In 50 procedures performed using a combination of n-BCA and Onyx, 1 permanent ischemic deficit and 1 death occurred. Both were related to a bleeding of the BAVM, identifiable on the periprocedural angiogram after n-BCA injection. No systemic (affecting blood pressure or cardiac rhythm) or local (vasospasm or thrombosis of the embolized vessel) side effects related to the DMSO injection were observed. Trapping of the catheter tip occurred during 4 embolizations using Onyx, without clinical consequences. In 3 of these cases, the microcatheter was broken, and in the other, it was intentionally left in place because of the long injection time and the length of the reflux. No catheter was glued during n-BCA injections. Distal rupture of the arterial feeder during catheterization occurred in 5 patients. The rupture was angiographically apparent during the procedure and the rupture site was immediately occluded with n-BCA without clinical sequelae. The prevalence of BAVMs is estimated to be less than 1 in 100,000 in the population.6 The annual cumulative risk of bleeding is estimated at 2%–4%, increasing up to 6% in the first year after a hemorrhage.2 The annual risk of mortality is less than 1%.7 The aim of treating BAVMs is primarily to eliminate the risk of an intracranial bleeding, achieved either by embolization, surgery, radiosurgery, or a combination of these modalities. A review of the literature shows 2 opposing strategies in the endovascular management of BAVMs. The first aims to occlude the main BAVM feeders before surgical resection to minimize intraoperative blood loss; the second focuses on occluding the entire BAVM, or at least on reducing the size of the nidus. To achieve the former, various particulate embolic agents (PVA, detachable balloons, silk threads, and coils) have been used.1,2,8 This treatment strategy is limited, however, because of the large sizes and unfavorable locations of many BAVMs are unsuitable for surgical resection. To partially or completely obliterate a BAVM, the use of a liquid embolic agent, such as n-BCA adhesives, is necessary. Prolonged injections are not possible, and only a limited volume of the nidus can usually be occluded by in a single injection.9 In 1997, Debrun et al10 reported on the advantages of using n-BCA (Histoacryl; Braun, Melsungen, Germany), as opposed to particles, for embolizing BAVMs in a group of 54 patients. These authors achieved complete occlusion in 5%–10% by embolization alone and observed 2 deaths, 2 transient neurologic deficits, and 1 permanent neurologic deficit. In a series of 150 patients, Lundqvist et al6 reported the most optimistic results so far, achieving complete occlusion of BAVMs using n-BCA in 13% of their patients. An occlusion rate of 10% has been reported by other authors.8,10–13 Valavanis and Yasargyl14 reported an overall rate of 40% of anatomic cure in patients with BAVMs using n-BCA. Nevertheless, the patients were previously selected according to the BAVM size, location, and type of arteriovenous shunts constituting the nidus. In this series, a complete obliteration was achieved in 69% of pure fistulous BAVMs (direct arteriovenous fistulas) and in 39% of mixed fistulous and plexiform BAVMs; the latter rate fell to 30% in the case of purely plexiform BAVMs. In our series, pure arteriovenous shunt BAVMs were not included because, according to our criteria, Onyx cannot adequately be injected in such lesions. Most of our BAVMs were plexiform. They were of mixed type (arteriovenous shunts and plexiform) in only 6 patients. In contrast to n-BCA, Onyx is a nonadhesive liquid. This basic characteristic eliminates the risk of gluing the catheter to the vessel wall and therefore allows a longer injection time and a wider range of different injection rates. Both facilitate occluding larger nidus portions per injection.15 However, despite this advantage, a microcatheter can be trapped within the feeding pedicle during Onyx injection, particularly during long injections, when too much reflux occurs or when the feeding pedicle represents a very distal and tortuous loop. At the beginning of our experience with Onyx, we faced 4 microcatheter ruptures. All of them broke when we pulled the microcatheter out of the feeding pedicle which had been catheterized. No clinical side effects occurred, however, in contrast to the report of Jahan et al (Fig. 2).15 By adjusting our technique to the factors mentioned above, we have been able to avoid trapping of the microcatheter during the last 2 years. Large left frontal BAVM treated in staged sessions. A and B, Initial angiogram in anteroposterior (AP) and lateral views showing various arterial feeders allowing for nidal catheterization. To reduce periprocedural or postprocedural ischemic or hemorrhagic complications, the BAVM was gradually occluded in 3 sessions. C and D, Nonsubtracted images in AP and lateral views showing the extensive Onyx cast. E and F, Final angiographic control demonstrating total BAVM occlusion. Regardless of Onyx or n-BCA being used, the primary goal of our embolization technique is to occlude the BAVM nidus. Adjuvant treatment options such as surgery or radiation therapy were considered only when a complete endovascular BAVM occlusion could not be accomplished. In our series, the use of Onyx was our first intention when access to the nidus was favorable and the criteria mentioned above were met. In cases where Onyx could not be injected safely, n-BCA was alternatively used to achieve a BAVM occlusion. When a direct arteriovenous fistula is present, the adhesive properties of n-BCA are advantageous and often avoid distal migration of the embolic agent. In 88 procedures performed using Onyx alone, we observed 1 ischemic and 1 hemorrhagic complication. On the other hand, Onyx injection requires an intranidal catheter tip position, carrying a higher risk of vessel rupture while navigating distally in small and tortuous arteries. If such arterial rupture was recognized during catheter manipulation, immediate injection of glue was helpful to prevent clinical consequences. In 1 of 6 cases, this rupture, however, remained clinically silent throughout the procedure, causing a large hematoma in the left basal ganglia area (1 of the 3 deaths) that was identified only at the time of the postprocedure CT scan. Finally, to obtain an optimal penetration with Onyx, a certain reflux of the embolic agent within the distal feeding pedicle has to be tolerated and can be controlled. The use of simultaneous biplane subtracted fluoroscopy proved to be very helpful. Good visual control of the reflux is mandatory to prevent occlusion of a normal territory and to avoid trapping of the microcatheter. Jahan et al15 observed no microcatheter trapping, probably because of the different technique used by this group. This is probably related to the fact that the goal of their embolization was to reduce the nidal volume, thus facilitating surgery or radiation therapy. The longest time of Onyx injection in their series was 12 minutes, a time that we consider to be relatively short when embolizing a large BAVM with the aim of total exclusion. Trapping of the microcatheter probably occurred more frequently at the beginning of our experience, because we initially tolerated more reflux so as to be able to treat large BAVMs. Since November 2002, most likely because of better control of the reflux, no microcatheter trapping has occurred. Although Onyx allows a better filling of BAVM nidus than n-BCA, we advise staged embolization sessions to reduce periprocedural complications. Therefore, even when nidus catheterization through more than one feeder can be accomplished, we prefer a staged occlusion of the BAVM in several sessions, regardless of the fact that Onyx can fully penetrate a nidus even in large BAVMs. In our experience, this approach also reduces the risk of ischemic complications and microcatheter trapping. Before our recent experience in using Onyx, we would not have asserted that staged embolization of BAVMs could indeed reduce the rate of postprocedural complications. Because of this change in our therapeutic strategy, endovascular treatment remains to be continued in 33 of the 94 patients, meaning that more technical and clinical complications may occur. The experience in using Onyx for embolization of BAVMs is still very limited and only few reports with relatively small groups of patients exist so far.15,16 The purpose of this retrospective study was to describe in detail the technique and experience our group has made in using Onyx in a larger series and to compare our results and complications with those in the literature. Jahan et al15 report in their series of 23 patients the benefits of using Onyx in BAVM embolizations associated with a low rate of postprocedure complications (4%). Their average volume reduction was 63%. Of 23 patients, 11 underwent surgical resection; in 12 patients, embolization was followed by radiosurgery. There was no report of a complete BAVM occlusion by endovascular approach only. In our series, when considering only the patients who have completed the whole cycle of embolizations, 49% of them have been cured from their BAVM by embolization as the sole treatment technique, the anatomic cure having been confirmed by a follow-up angiography performed 6 months after the end of the treatment. In 13% of the cases, embolization was followed by surgery and in all but 1 patient (who died during surgery), an angiogram was performed within 1 week after surgery in which no residual BAVM was seen. The goal of treatment in this study, however, was to reduce the BAVM volume before surgical resection or to radiosurgery. We are able to confirm their promising results in terms of occlusion rate. It remains difficult to compare their neurologic complications with ours however, because they did not report the complications of all the treatments including the ones related to surgery. Even though both embolic agents have been used in this group of patients, we did not intend to compare Onyx and n-BCA directly in terms of their effectiveness or related complication rate. It is obvious that the agents differ significantly, not only in their properties and subsequent indications for use but also in various other aspects, such as catheter compatibility, cost, etc. Therefore, such a comparison, though necessary and ideally performed in a controlled randomized trial, will practically be difficult to conduct. Furthermore, as demonstrated by our study, these embolic agents should not be considered solely competitive but may be used to some degree in a complementary way, depending on local hemodynamics within a BAVM nidus. Because of its nonadhesive nature and penetration characteristics, Onyx is a promising embolic agent for EVT of BAVMs. Accepted after revision May 25, 2006.